Although small geographically, New York is one of the country's most populous places. It boasts a wide range of colleges to meet its residents' diverse needs and interests, so students will need to do their research to find the right fit. This page offers tools and resources to help prospective students choose schools that match their academic and personal needs. Learn how the state's best colleges are ranked, explore outreach and assistance programs for New York students, find out the real cost of attending school, and see how New York colleges compare with those nationwide. New York hosts an overwhelming 325 public and private nonprofit universities, and picking the right one is no easy task. 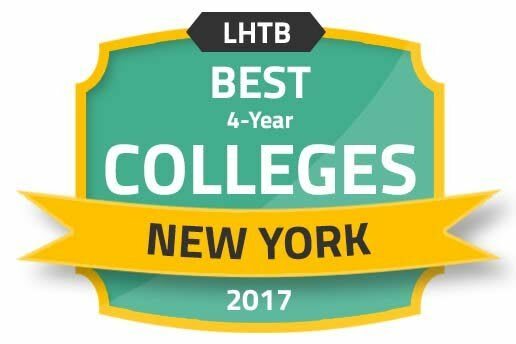 Prospective students can take a look at this list of best colleges in New York to get an idea of what to look for in a high-quality college. Rankings are determined by a combination of factors, like the cost of tuition, availability of financial aid, graduation rate and student-to-teacher ratio. With so many options, prospective students may want to see the pros and cons of the schools on their shortlists of potential colleges. Using the tool below, students can tailor their search to find schools that not only fulfill their academic goals, but also accommodate their finances and lifestyles. Users can filter by variables such as student population, cost, school type and available degrees, and compare schools side-by-side. Not only do individual colleges in New York offer financial aid and other student support programs, the state as a whole has a variety of programs and initiatives designed to help current and future college students prepare, budget, and succeed in college. From helping high schoolers understand the ins and outs of state and federal financial aid to boosting enrollment of minorities, New York is working to make postsecondary education attainable. This comprehensive financial aid awareness website, created by New York's Higher Education Services Corporation, aims to help students understand the FAFSA and other aspects of financial aid. Start Here Get There gives students step-by-step instructions on filling out the FAFSA so they can get the most federal aid with as little stress as possible. Students can also get helpful advice on specific questions such as filling out parent information if a parent has remarried, and can find local events to attend if they want in-person help. Information on financial aid specific to New York students is also available through Start Here Get There. The My Brother's Keeper (MBK) Task Force was originally created at the federal level by President Obama in 2014, but in 2016, New York became the first state to enact the MBK initiative into law. The purpose of MBK is to provide support to boys and young men of color to improve their educational outcomes. At the national level, MBK has six primary goals, including elementary and secondary academic success, and college and career readiness for all children and young adults. New York has added other goals to the list, including access to high quality education; expansion of early warning, prevention and intervention programs; and breaking down structural and institutional racism. CSTEP was put into place to help historically underrepresented and low-income postsecondary students who were interested in careers in science, health, math and technology. CSTEP helps students with services such as career development, admissions counseling and applications, access to standardized test prep courses, and internships and other practical training. New York has 44 CSTEP programs throughout the state, and participation is competitive, so interested students need to complete an application. To get an accurate picture of college costs in New York, it's imperative to look beyond the sticker price of tuition. Financial aid is another big part of the equation, and schools vary with how many students receive awards and how large the average financial aid package is. Check out the following charts to learn about tuition and financial aid of New York colleges and see how the state compares with the national average. New York offers colleges for many budgets, but the bottom line is just simple math: tuition minus financial aid. Although certain schools may have higher tuition, costs can be offset with extensive financial aid packages, putting them within reach. Based on these factors, the six colleges below ranked as New York's most affordable. For many students, a primary goal of earning a degree is to get a high-paying job upon graduation, and some schools do better than others in producing well-paid alumni. Here we look at the average earnings for New York graduates, along with the six colleges that yield the highest paid alumni 10 years after starting college. Even with help from scholarships and grants, students often have to take out loans to pay for college. See where New York stands in terms of student debt after graduation, and check out the New York schools that leave their students with the least amount of debt upon program completion. Comparing tuition rates and financial aid packages is a start when figuring out the costs of college, but students also need to account for living expenses like rent, utilities, transportation and food. Costs of living for the state as a whole come in well above the national average, but they vary widely between cities. The table below reviews New York's overall cost of living, as well as the numbers for the state's five largest metro areas. Students can begin to narrow their list of potential New York colleges by looking for accredited institutions. Accreditation is a voluntary process; schools may undergo these quality-assurance evaluations to demonstrate that they meet specific standards. Only accredited schools qualify for federal funding, so they often have more financial resources for teachers, facilities and research. Furthermore, students who attend unaccredited colleges do not qualify for federal financial aid, and may not be able to transfer course credits should they move to an accredited institution later. American Speech-Language-Hearing Association's Council on Academic Accreditation accredits the Communication Sciences and Disorders program at Columbia University. Accreditation Commission for Education in Nursing accredits the nursing program at Onondaga Community College. New York City is home to nine public colleges and 44 private ones, offering study options ranging from intensive technological research to niche programs in the performing arts. Many are recognized throughout the country and even globally, so the Big Apple's student population reaches far beyond local residents. Columbia University is a private, not-for-profit Ivy League university and is the oldest college in New York. Consistently ranked in the top ten colleges nationwide, it has 21 different schools with an array of majors and minors within each. About 6,000 undergraduates attend Columbia; the college focuses more on graduate education and has an additional 20,000 grad students. NYU is one of the largest private universities in the country. Founded in 1831 with only 158 students, NYU's 4,500 faculty members now serve over 50,000 students between campuses and study sites around the world, including degree-granting campuses in Abu Dhabi and Shanghai. Undergraduates can choose from 25 different degree programs, and some 2,500 individual courses. Part of New York's community college system, BMCC offers over 30 academic programs to more than 26,000 students. Students can earn associate degrees and certificates in a variety of subjects, from accounting to video arts. Along with its academic programs, BMCC also offers internship and study abroad opportunities, access to an advanced media center, and childcare services. Syracuse has an even distribution of private and public colleges to serve students. The city's four public colleges include both subject-specific institutions, like the SUNY College of Environmental Science and Forestry, and those with a broad range of degree programs, like Onondaga Community College. Its four private colleges function similarly, with nursing colleges, religiously affiliated schools and colleges with an array of degree options. Below is a sampling of what prospective students can find in Syracuse. Syracuse University is a private research university with more than 21,000 students, about a quarter of whom are from minority populations. SU undergraduates can choose from over 200 majors and 100 minors, and graduate students can earn degrees in some 200 areas of study. Students can also take advantage of study abroad opportunities, online learning options, sports teams, and student clubs and organizations. A two-year public institution that is part of the State University of New York (SUNY) system, Onondaga Community College offers over 40 degrees and certificates and has more than 80 transfer agreements, making it easy for students to transition to four-year institutions. Students can pursue associate degrees and certificates both on-campus and online. OCC also provides students with over 55 scholarship opportunities, on-campus housing and a variety of student clubs and organizations. LeMoyne College is a private Jesuit college with undergraduate, graduate and continuing education opportunities. Students can choose from over 30 majors while being immersed in the college's Catholic and Jesuit core curriculum. Lemoyne's largest school is its College of Arts and Sciences, but students can pursue degrees from the Madden School of Business and the Purcell School of Professional Studies, as well. Students can also take advantage of campus housing and dining, several school organizations and the campus ministry. Prospective students can continue researching colleges in New York by checking out these resources. Find information about New York's education system, including higher education resources and news. New York's higher education financial aid agency provides students with information about finding and applying for financial aid. The site also offers tips for college prep and the loan repayment process. Learn about colleges and scholarships for New York students at the Office of Higher Education's website. The site offers information about starting one of these state-sponsored savings plans to help cover college costs. Get information about adult education services in New York. The hubpage for New York's state university system is the portal for information about New York's public community colleges and universities.